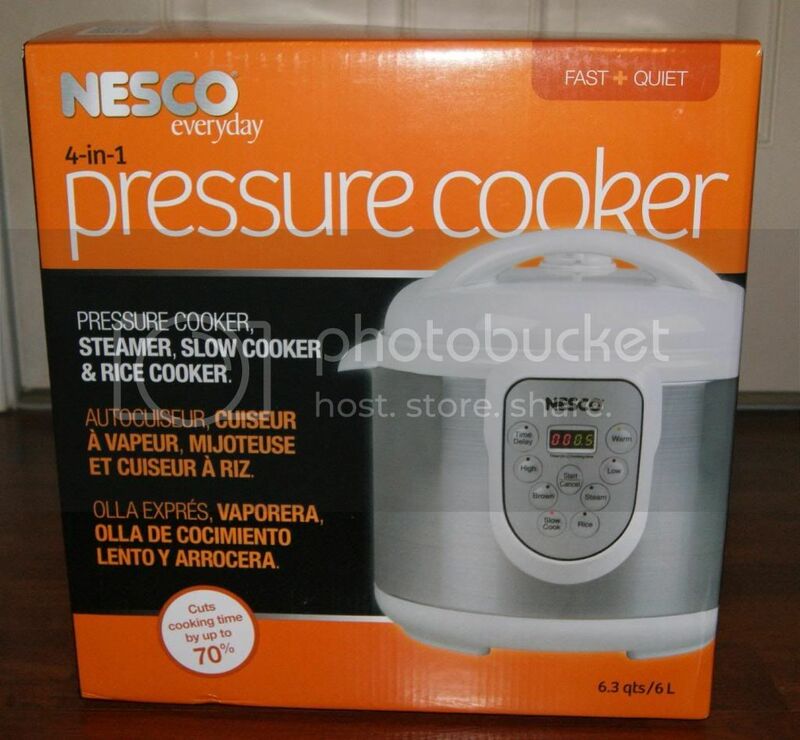 Andrea's World Reviews: Nesco 4 in 1 Digital Pressure Cooker Review and GIVEAWAY!! 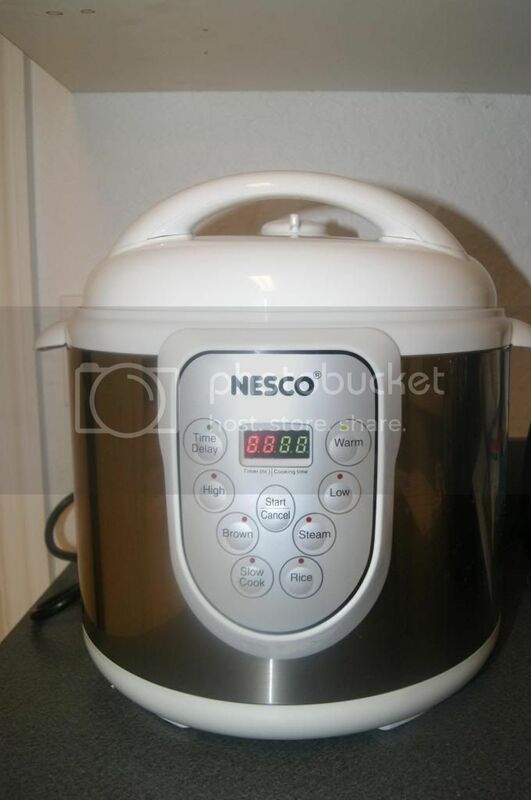 Nesco 4 in 1 Digital Pressure Cooker Review and GIVEAWAY!! As a busy stay at home mom, I love any product that can make my life easier. One of the biggest challenges I face. My husband usually wants to eat at about 8pm. The trouble it that I usually want both kids in bed by then too. That means I have put my daughter to be. Try to keep my son quite long enough for her to fall asleep all the way(which with him being autistic is VERY hard). Then I help my son with his homework, bathe him and read him a story. I have to do all this in the time I should also be cooking dinner to get it done by 8pm. So needless to say, it was not always done on time, and I would find myself starting dinner at 8. Then it would take 30-60 minuted to cook the meal, and dinner ended up being very late. So I wanted something to make cooking easier and faster, and boy did I find it. The Nesco (6 liter) 4 in 1 Digital Pressure Cooker is everything I need and more. I have never even owned a pressure cooker, but I still know this one is special. When I think of a pressure cookies I think of a metal pot with a locking lid, but this is nothing like that. This cooker looks really impressive. Sleek and modern. It's wonderful. My son called it a robot, and I can see why it would resemble on to him. This cooker can make practically anything. Everything from potatoes to meat, to fruit. It even makes rice. You can also Brown meat prior to cooking it, and use time delay to have dinner start cooking at a certain time(so it is ready when you get home. And you can use it as a slow cooker as well(which is awesome because my slow cooker is junk). As I already mentioned, I am a complete pressure cookie novice. So I attempted my first ever pressure cooked meal, and I am actually pretty happy with how it came out. I decided to try a whole chicken. I loved the idea of being able too cook a whole chicken in under 30 minutes. It was so simple. 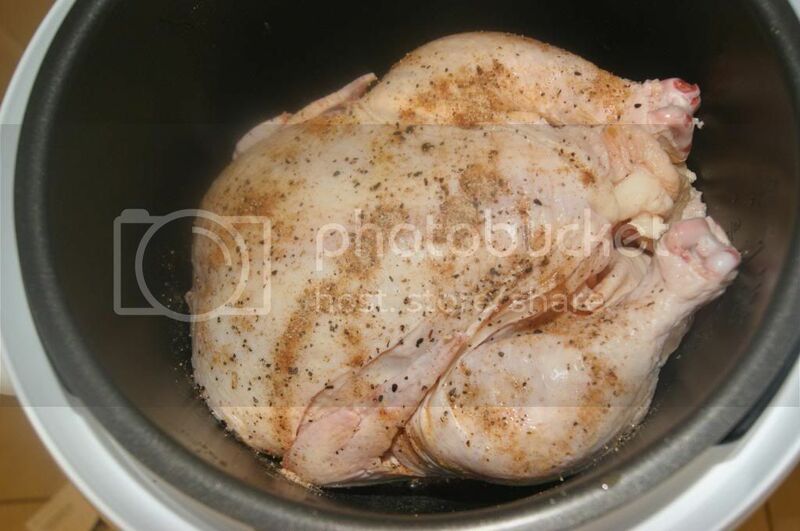 Just put the raw chicken in the pot, season it, add 2 cups of liquid and cook on high for 25 minutes. I should have used the brown setting first to make the outside more golden, and I feel silly for not doing it, but it still came out really good. The chicken was so moist. I was really unbelievable. Here is the finished chicken. It tasted so good. My husband loved it and we both agreed that is was just as good as chicken from a restaurant. I cannot remember the last time he raved about a meal so much. He ate the leftovers on a sandwich earlier and kept saying how delicious it was. My husband is by no means ungrateful, but he is not usually that emphatic about anything, but especially just a meal(and even more something as simple as chicken). I love this Pressure Cooker so much. I cannot wait to try other things in this, especially actual recipes. 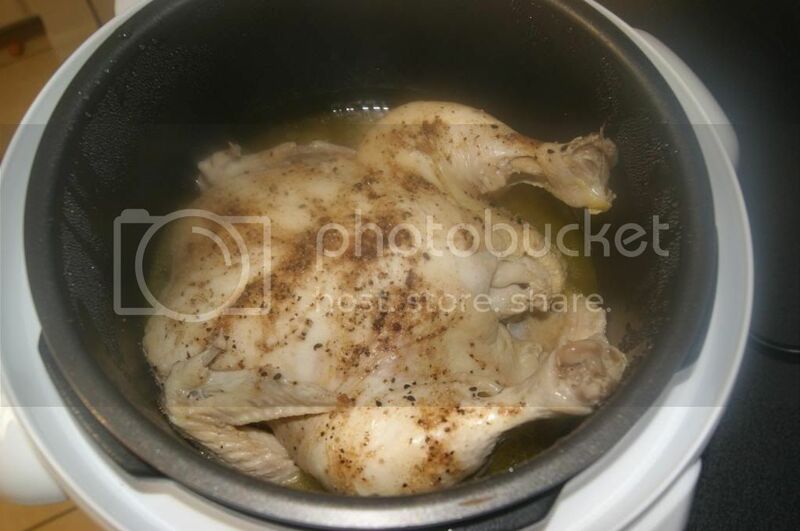 I love to try new recipes(which are even included with this pressure cooker). Cooking without all the work. No stirring, flipping or guessing. The food will be so moist and cleanup a breeze. The removable pot is non stick for super easy cleanup. And even better, this is so quite. I imagined that it would be kind of loud, but no, so I can cook while my daughter is sleeping with no fear of waking her. It's even quieter than a sizzling frying pan or my microwave(which is actually pretty loud for some reason). I am so excited to keep trying more things in my new, fabulous Nesco Digital Pressure Cooker. I am am so thankful for all the time I will save. And this will even make healthier food since I won't need fats and oils for cooking any more. There is nothing more I could want. This is the perfect all in one cooking machine. I think that everyone should have one. And to prove it, we are giving one away to one lucky winner. Enter below. Good luck. I like everything about this! But that it has rice cooker is a huge plus. I love the fact that you can cook an entire chicken in only 25 minutes. I love that you can cook things so quickly. I like how fast they cook things. I like how versatile they are, cooking everything from meat to rice. I love that it is a rice cooker as well! Wow. Nice to see a resurgence in the use of the pressure cooker. Convenience at its best. I love that it can make ANY cut of meat tender... Makes the BEST ribs!! I like that you can cook anything in this pressure cooker, you can even cook rice! My family loves rice with their meals, and to not have to have another item such as a rice cooker is really nice! Its MUCH more modern than my mother's pressure cooker...Id love to try it. The amount of flavor you get when cooking with a pressure cooker. I like that it's Nesco. I know I can trust that brand! I like that it is self contained. Things cook quicker and meats are much juicier! I don't have one yet, BUT I sure would love to win one of them!!!! I fell in love with pressure cookers way back in 1967-----as of now, I own 3 that you use on stove & one electric one. Sometimes I have 2 or 3 in use at the same time. I USED to have a pressure canner, but I foolishly loaned it to a "friend" & never got it back! 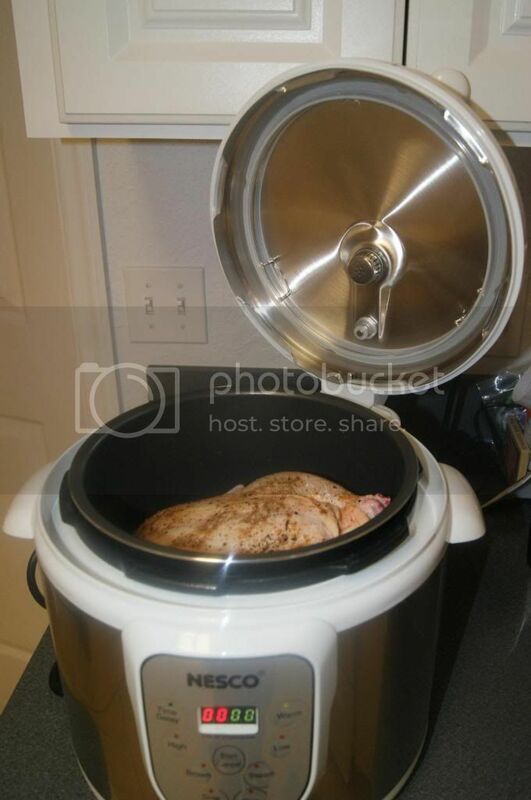 I'm a huge pressure cooker fan and have been blogging about my 'old' nesco for months at tracycooksinaustinDOTcom. i need to win the new one :) fingers crossed! I like that it makes cooking faster! My mother in law has one and it is so quiet compared to the stove top ones and I would love to have one. That it cooks things so quickly...along with that fact that it can make practically anything! I just recently bought a nesco roaster oven, for this same purpose, and i love it! i have a family of 6, and things get stressful easy, so having an easy dinner will make things better for me. That it's made by a company I know and love! That is looks like a rice cooker! I like that it's 4 in 1 and it looks easy to use. I like that it has a non-stick removable pot inside. I love how fast it cooks! I've wanted to try a pressure cooker for a long time. This one looks so easy to use!